The first movement of the Sonata in 4 parts for two Violins, Bass Viol & Continuo No. 9 ("The Golden Sonata") in F major (Z. 810) features constant interplay between the treble and bass voices. It is followed by an Adagio full of plangency, sighings, and chromaticism. The F major Allegro that follows is very fugal. Its theme is that of a trumpet fanfare in character. Sometimes he pairs the upper two voices together, and at times they dialogue in a rather joyous contrapuntal texture. The Grave again is in minor, very slow, and very somber. The final Allegro brings us back to the dance. 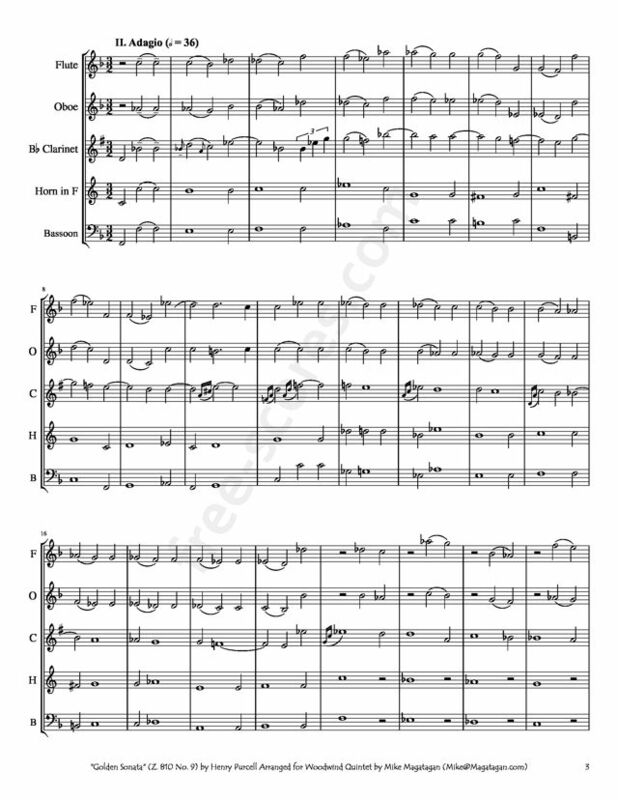 Its in triple time and filled with running sixteenth note passages and rhythmic interplay. One of the most important influences on the composition of music in the late 1600's was the rise of the public concert. After the Restoration John Banister began renting halls and inviting the public, for the price of one shilling, to hear their favorite performers. It was an informal gathering of people who liked chamber music. 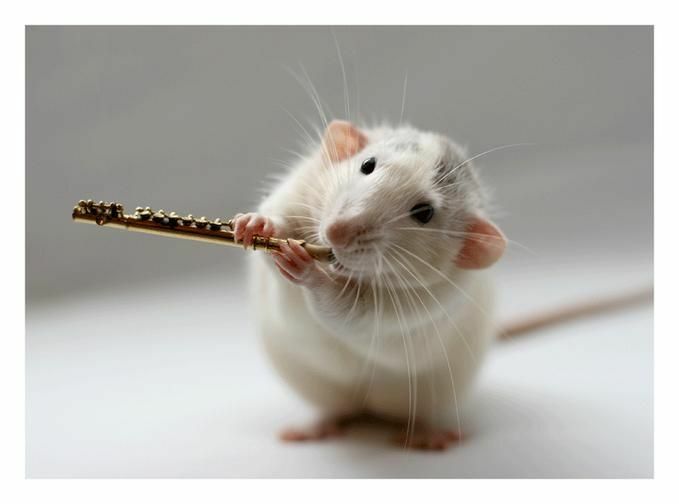 The audience could call out the tune or piece that they wished to hear, and the performer would try to oblige them. It was this type of public concert that was in vogue when Purcell was a young man, and it was at these that he heard the works of contemporary composers and was exposed to contemporary forms. The rise of the public concert as a viable commercial enterprise ensured the rise of popular forms of music such as the trio sonata. Purcell knew the works of such composers as Vitali, Carissimi, and Monteverdi, and it was after the style of the Bologna school of instrumental music of Vitali and Cazzati that he patterned his own trio sonatas. He called them the "fam'd Italian masters" in his introduction which stated that he wished to further their music. Cazzati was essentially a conservative composer with an intense interest in counterpoint. Vitali liked to experiment within a contrapuntal framework. His chamber sonatas were a group a dance movements. His church sonatas, the type Purcell was emulating, had four or five movements alternating between fast and slow tempi. Vitali was a fine violinist, and his themes are idiomatic for that instrument. His fugal or contrapuntal texture is supported by his harmonic motion; a system of chordal relations was beginning to be utilized and regularized by the Bologna school. This was the beginning of the high baroque. Purcell's trio sonatas were published in a set of four books by his widow Francis posthumously. The ten treated here belong to the latest set of trio sonatas. They are in the style of the "fam'd Italian masters" in many respects. They are harmonically full of direction, and show a command of the new tonal system. Many of the melodies are Italianate and expansive; the string writing is full and lush. They are beautiful works. Much of the harmony is still typically Purcellian and English in its treatment of dissonances, its contrapuntal writing, and its attachment to modality. But the flavor of Vitali's and Cazzati's writing comes through quite strongly as well. At this time the trio sonatas were accompanied by harpsichord, the cello and harpsichord creating a duo, and the two violins were treated somewhat as equal voices. 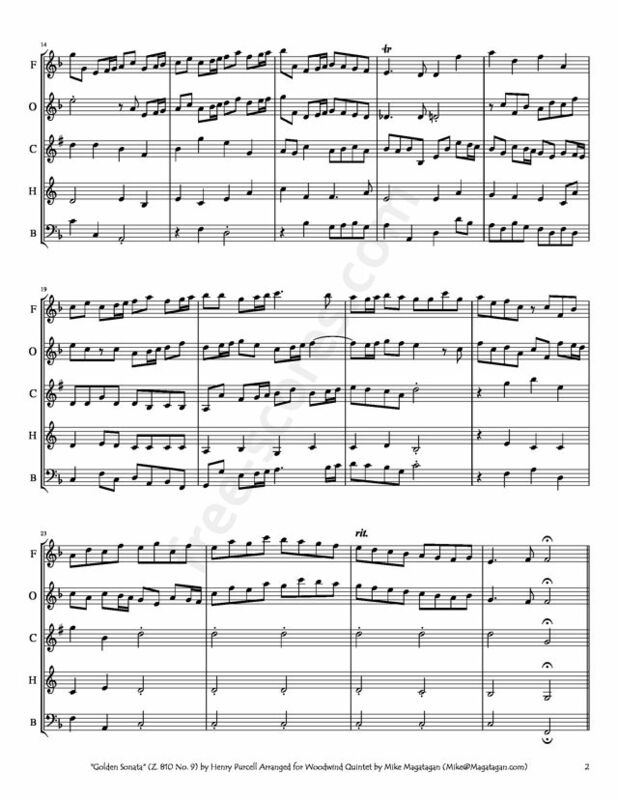 But there was a growing tension between a style that wrote for the two violins together in a first and second violin style in the manner of the classical string quartet, and the treatment as them as two independent polyphonic lines that could work separately or as one. Purcell tends to be of the latter group, but here and there in these pieces one finds him breaking away to a more Italianate lyrical style and giving the violins a quite "modern" treatment. 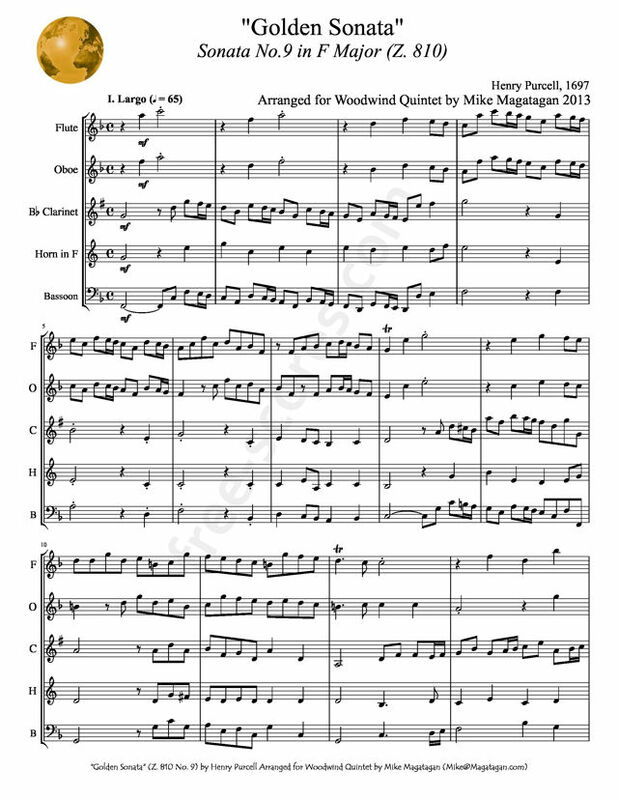 Although this piece was originally written for Violins (2), Bass Viol & Continuo, I arranged it for Woodwind Quintet (Flute, Oboe, Clarinet, French Horn & Bassoon).